Tecumseh is located in southeastern Nebraska within the scenic Nemaha Valley and is among the earliest settlements in Nebraska. It has a rich heritage in its downtown historic district centered around the Johnson County Courthouse, which was declared a national historic district in 1968; in fact, it was the first town in Nebraska to receive this recognition. Its picturesque Courthouse Square was used as a backdrop for the TV mini-series "AMERIKA" which was filmed in Tecumseh. Among notables native to the Johnson County area, Col. Barney Oldfield was born in Tecumseh and graduated from Elk Creek high school. Hollywood publicist, script writer, magazine writer, author, and war correspondent, Oldfield remembers his Nebraska roots and has contributed generously to the promotion of education through scholarships to the county's school children. In his honor and appreciation, the Colonel Barney Oldfield Memorial Highway was designated in 1996 to that stretch of Highway 136 east from Tecumseh to the Johnson County line. The Col. Barney Oldfield Exhibit entitled "Believe It or Not" - The Life and Times of Vada and Col. Barney Oldfield created by the Nebraska State Historical Society is a permanent exhibit in Tecumseh and features Col. Oldfield's military uniform. Tecumseh was named for the great Shawnee Indian Chief, Tecumseh, who was killed in the Battle of Thames in Canada during the War of 1812, reportedly by Col. Richard M. Johnson, for whom the county was named. 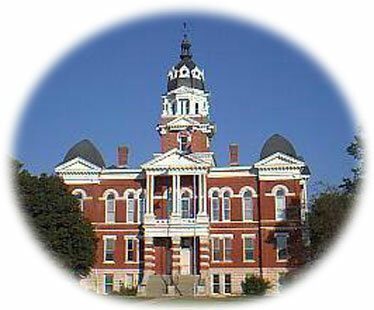 The town was incorporated in 1856 and named the county seat in 1857. Tecumseh was a pioneer town inland from the Missouri River lifeline and had to struggle to survive. Overland transportation was expensive and hurt the town's ability to market its goods. Therefore, the routing of the Atchison and Nebraska Railroad through Johnson County in 1872 was critical to the growth of Tecumseh. With the development of the railroad, building types changed, producing a superb collection of brick Victorian and Italianate architecture between 1875 and 1895 which remains today in the historic district. Important structures of this period include the Opera House, Courthouse, and City Hall. A history of Johnson County can be seen at the Johnson County Museum. On display are items from the era of the Indian including rare, unbroken containers dating from 1200 to 1400 AD, to 1700s glassware, to pioneer and present day collections. The Tecumseh Opera House is a two-story brick building on the west side of the courthouse square. Listed on the National Register of Historic Places, the building was built in 1880 by W.R. Spicknell and W.H. Hassett.